Eat, sleep, surf. Do you want to surf the best waves bali has to offer, while staying in comfortable accommodation with other traveling surfers? Look no further – you have found the best bali surf camp, run by surfers for surfers. 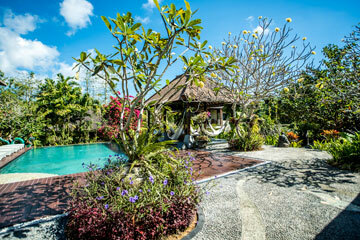 We are Bali’s premier Surf Camp and Yoga Resort. We offer surf guiding for advanced surfers, or surf lessons for beginner and intermediate surfers. Bali Surf Camp is architect designed and custom built for travelling surfers. Located near the best surf breaks in the world, there are a variety of breaks nearby suitable for surfers of all standards – beginners, intermediate, advanced and expert. Uluwatu, Padang Padang, Impossibles, Bingin, Dreamland and Balangan are all easily accessible from the centrally located Bali Surf Camp. Every day we take surfing pictures and upload onto the Bali Surf Report. Bali is the premier surf destination and this is the premier Bali Surf Camp and Surf School. Come join us in the ultimate surfing advensure.